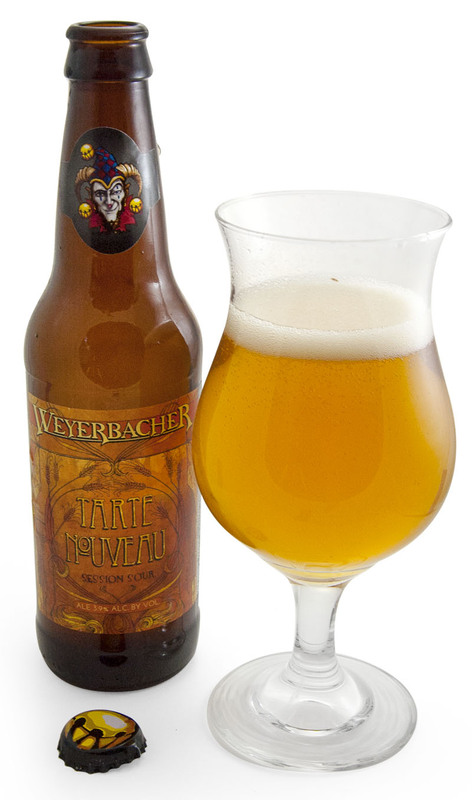 Tarte Nouveau is a Lactobacillus kettle-soured tart beer with a lemony-citric fruit sharpness and no hop bitterness. Move over Arnold Palmer—the drink, not the golfer.This tasty session beer pours with no head and looks rather still after it settles into the glass, but still has a very nice carbonation on the palate. Mild lemon juice and vinegar notes on the nose. Bit of grassy/herbal notes, too. Very light body. Mild tartness with some tannins. Reminds me of carbonated iced tea with lemon. Really refreshing: perfect for quenching my thirst on the first 80-degree day of the year! Pair with salted peanuts, salted pretzels, or anything involving sunshine! Great session beer. Wisps of flavor and aroma come and go—crisp apple, raspberry, fresh hay, black currant, and honey—like trying to catch smoke. Sours are quickly going mainstream, and this is a beer that will introduce scores of drinkers afraid of that s-word into the fold. Subtle and mouth watering, with a touch of citrus acid. The low carbonation can easily make this one to gulp after a long run, or a hot afternoon of outside work. John Holl is the editor of All About Beer Magazine, the host of The Beer Briefing on iHeart Radio and the author of three books, including The American Craft Beer Cookbook. Find him on Twitter @John_Holl.